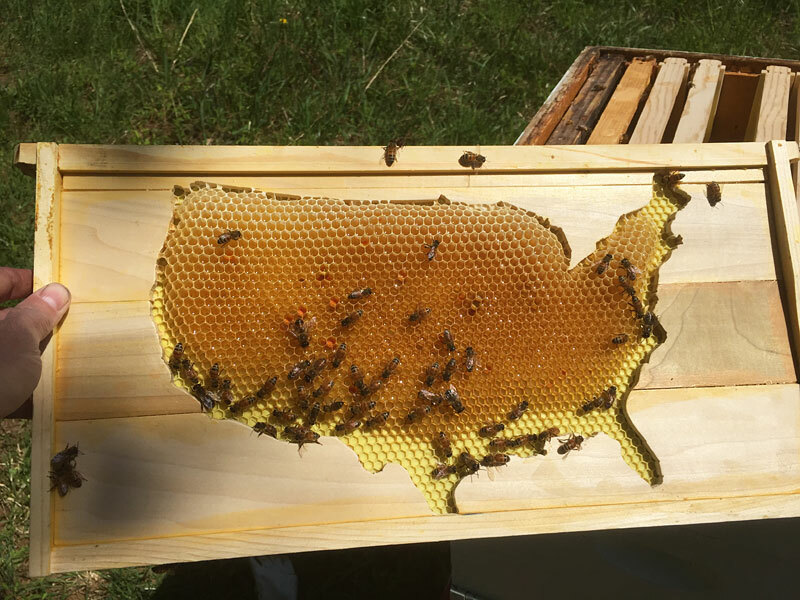 I've recently started an experiment with my bees that involves a wood frame and wax foundation in the shape of the United States (lower 48). In two weeks, they've made a lot of progress and show a knack for US geography without any prompting on my part. California and the Pacific NW are extremely popular and apparently too small, as the bees have built burr comb to make the west coast bigger. They have built-up the Rocky Mountains as the high point of their map; and constructed a very large island off the coast of the Northeast. Perhaps an enlargement of overcrowded Manhattan? Otherwise, there's not much happening on the East coast. They've made some progress on the northern section of the Appalachian mountains, maybe a Catskills retreat for Manhattan bees to get away. Florida gets zero attention because the peninsula is too small for bees to make it worth their effort. The Southeast, Midwest and Texas are basically flat but above sea level (if you imagine the wood frame to be their ocean). Nearly all of the nectar and pollen are stored in the bread basket of our nation. Good job little geography bees! This video documents a wax-coated frame in the shape of a US map (lower 48) as it evolves within a beehive. I shake the frame to disturb the bees and observe how they move in response. No bees were harmed in the making of this video. To the contrary, I do everything I can to keep my bees alive and healthy. 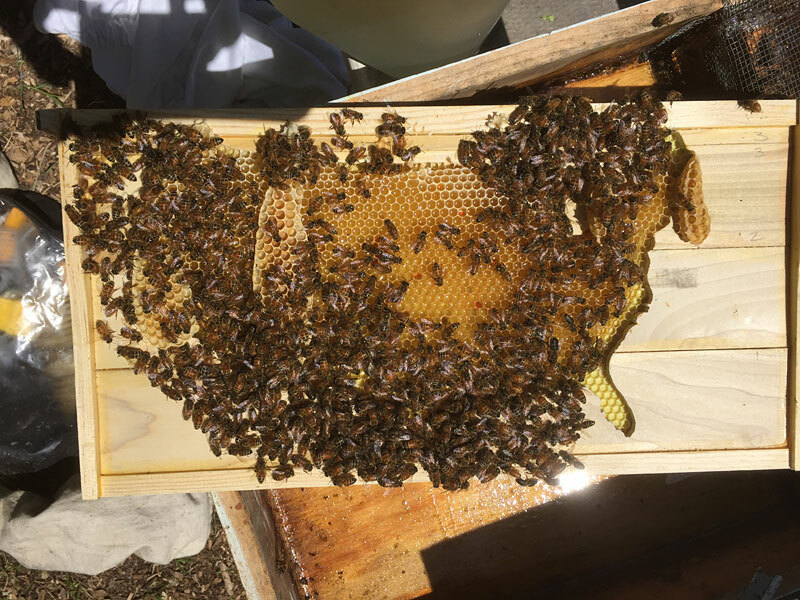 My package bees were installed a week ago and have since drawn some comb on the frame which is filled with nectar. These areas are darker in color and the nectar is reflecting the sunlight. See into a young beehive. This video was shot with an inspector's videoscope, so the frame rate is low and makes it look choppy. Nonetheless, the videoscope allowed me to record activity inside of one of my new hives - and by chance, I caught footage of their new queen only two days after installation from a package that shipped in from Georgia. You can recognize her because her abdomen is larger, more of a pale yellow and her wings are set out to the side instead of folded onto her back. My apologies that she is not marked, this would make it much easier to recognize her ... and I need to take care of this before the hive population increases. Notice areas in which the honeycomb is shallow and others where it is fully formed. 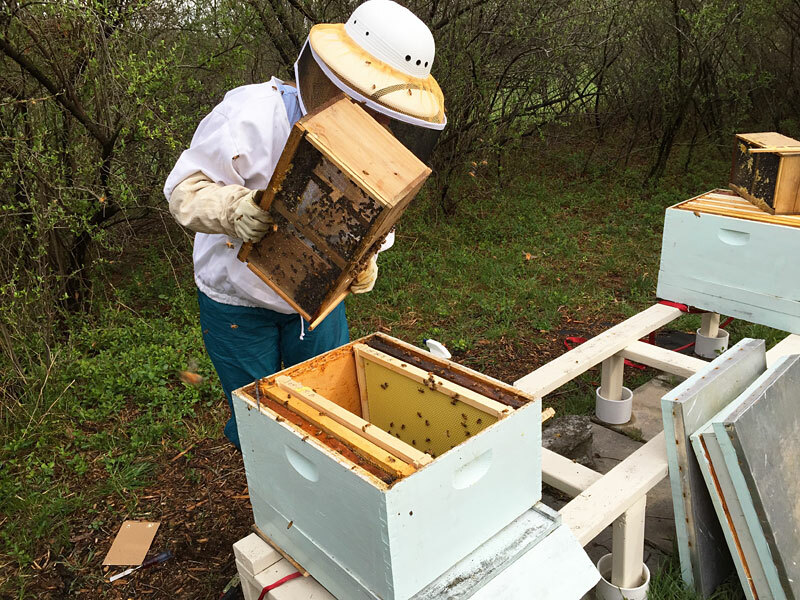 This is because I gave the bees some frames with new foundation mixed with frames that already had drawn comb with honey. If possible, I try to feed my bees with honey instead of sugar water because it's better for them; and I have many frames with honey from my hives that sadly died in late winter of this year. Below are images from the package installation, two days before this video was taken. Photos by Sarah Loy, 2015. Happy day! My bees arrived after their long road trip from Georgia to Virginia. Because it's raining and bees dislike dampness, I will install them tomorrow when the weather is dry. Plus it's fun to keep them overnight in my studio and get to know them. This video shows them lick honey that I smeared onto the outside of the packages. Packaged bees are shipped with sugar water to feed them in transit, but they much prefer honey -- as this video shows.